In 1984 Héroes del Silencio was formed and climbed to heights that no other Spanish or "Rock en Español" band had ever reached before (and which none have reached to date). Their unprecedented success in Spain brought many accomplishments and worldwide accolades. 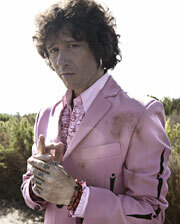 However, lead vocalist Enrique Bunbury felt the need to change, grow, explore new territories and break old boundaries...and decided to strike out on his own. Now over 15 years and several successful solo albums later, we invite Bunbury to The Clive Davis Theater to celebrate Bunbury's most recent release Licenciado Cantinas, a musical tribute to some of the most celebrated Latin American songwriters. After an in-depth discussion and Q & A session, moderated by University of Southern California Professor Josh Kun, Bunbury will perform a selection of songs.